There are numerous publicly available pipelines and processes exist in DolphinNext website. In the main page, you may click on Learn More button and investigate the pipelines you interested. In order to reach process details just click settings button at the top of the process circles. 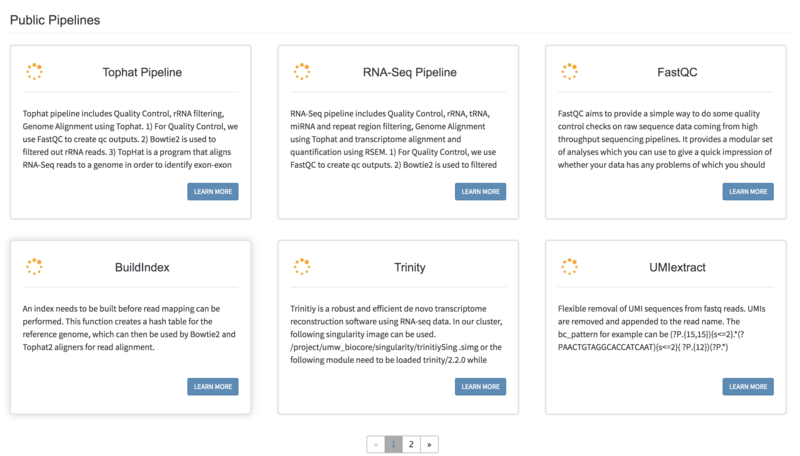 piPipes is a set of pipelines developed in the Zamore Lab and ZLab to analyze piRNA/transposon from different Next Generation Sequencing libraries such as small RNA-seq, RNA-seq, Genome-seq, ChIP-seq, CAGE/Degradome-Seq. Please see their Wiki pages (https://github.com/bowhan/piPipes/wiki) for the original content. These pipelines are loaded to DolphinNext to facilitate their usage. An singularity image is provided (shub://UMMS-Biocore/piPipes_singularity) where all the neccessary programs are installed to execute the piPipes. © Copyright 2018, Alper Kucukural, Onur Yukselen Revision e37af536.